Project management is a one-time carefully planned and organized effort to achieve a specific goal. Project management includes:Developing a project plan, which includes defining project goals and objectives, specifying tasks or how goals will be achieved, what resources are need, and associating budgets and timelines for completion Implementing the project plan, carefully to make sure the plan is being managed according to plan. 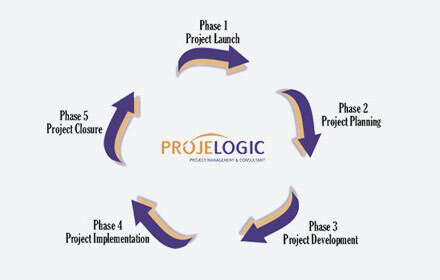 Project Initiation is the opening point in the 5 steps Projelogic's Project development Cycle, (based on the PMBOK® methodology) and in simple terms: starting up the project. We initiate a project by defining its reason, business goals, and scope. The reason for initiating it, and the propose solution to be implemented. We will also put together a project team, define early milestones, and early budget proposal. With the above information we can move on and perform an end of Phase study in order to get a GO No GO decision. Once we define the project and assemble the project team, we are ready to enter the in depth Project Planning phase. This involves creating the "PMP", Project Management Plan, in order to guide the team during the project development and after. We will define the Required Skills of development team. Define Non-labor Resources, Risks plan, detailed action items and milestones. With a comprehensible characterization of the project and the full and detailed PMP, we are now ready to enter the Execution phase of the project. This is the stage in which the requirements are actually built and programmed. After the QA process the product will be presented to the customer for acceptance and full implementation. If the customer has accepted the final product, the project is complete and ready for closure. Project Closure involves releasing the final product to the customer, handing over project documentation, Manuals, Source code, and Network layouts. Last remaining step is to undertake a Post Implementation Review to identify the level of project success and note down any lessons learned.